I recently noticed that I had a bunch of Donner Lake photos and that this incredible lake less than a 10 minute drive from my house in Truckee, CA deserved a "gallery" of it's own. So I did a little rearranging and created an online gallery for my little local treasure. Many great family moments have happened along various Donner beaches and docks over the years, fishing, kayaking, camping, bike riding and West End Beach parties, most unrecorded by camera, only by the brain. I hope my son remembers a bit of the visits in the same way I have flash memories of my favorite childhood lake visits. 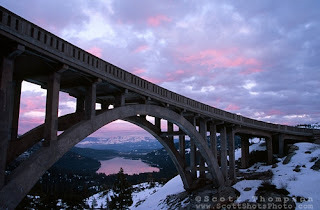 "Sunset at Rainbow Bridge"- Rainbow Bridge is located up Old Hwy 40, west of Donner Lake. 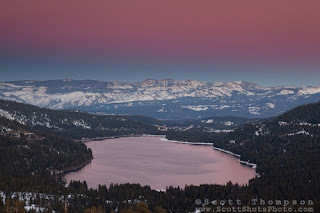 Donner Lake and Truckee, CA can be seen in the distance. 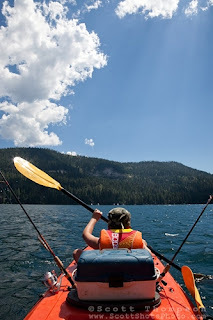 "Boy Kayak Fishing on Donner Lake" - This young boy was photographed kayak fishing on Donner Lake, CA. 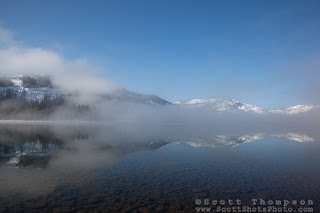 "Donner Lake Morning 3" - These foggy lake and snow covered mountains were photographed at Donner Lake in Truckee, CA. The above photographs are all available as fine art prints, gift items, and stock photography.